If you are in a hurry, you can prepare a planting bed in any number of ways described in detail in numerous books and on countless websites: You could rent a sodcutter to remove lawn, you might use a spray herbicide to wipe out everything that’s growing, or you may use a sheet of plastic, sealed tightly around all sides, to solarize (“bake”) a site to death. Tilling is another method of preparation, but since it uses a lot of energy, tends to churn up weed seeds, and takes months to enact, we recommend using carpet to eradicate existing vegetation. By posting a sign near the road that read “Wanted: Old Carpet,” we were gifted with free delivery of a free material that saves us lots of labor. Now that we have prepared most of our own property, we continue to shift the carpet outward onto industrial property on which we have permission to landscape. When the carpet is no longer used for this purpose, we will either cut it into strips to line paths, set it out with the regular trash, or allow it to decompose if it is made up of natural fibers. Leave the carpet down for at least full growing season (spring through fall). (Don’t use cheap, rubber-backed carpet as it may break down into a mess.) Right-side up or upside-down shouldn’t matter. The color of the bottom side might be less offensive to you. Top with an inch of woodchips if aesthetics really matter. While the carpet is working for you, take the time to learn more about native plants, collect seeds, and incubate ideas. 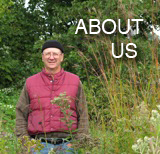 Take advantage of the knowledge available from your local native plant society, Wild Ones chapter, or nature center. • Strap to hold container at hip level so both hands are free to operate. The charming art of harvesting seed can begin with Pasqueflower as early as May, but the greatest volume of native seed is collected in the fall about a month after flowering has ended. Stems should be brown and dry, seed capsules should open under slight pressure, releasing hard seeds which appear brown or black. If the seeds do not appear ripe, wait and collect them at a later date. On a site where you have permission to collect, gather no more than half of the seed of a given species. If a plant is low in number, do not gather any seed so as to prevent its extinction on that site. If you recognize tha an area is in decline due to invasives, development, or changing ecology, investigate whether you can improve the site or rescue the surviving native remnants. If you find an uncommon species, report it to your Department of Natural Resources Office of Endangered Species. While a novice, join others who have experience and can guide you in collecting. When on your own, think ahead and locate species while they’re in bloom for easy identification. Then mark them so you’ll recognize them in their dried state. With a couple years of experience, this won’t be necessary, and you’ll no doubt become pleased with your expanding abilities. Collect on a day when the vegetation is dry, avoiding the morning if dew has settled over night. Write on your bag or envelope prior to picking seed (better than writing on a filled, lumpy bag). Include the species, date, plus location and site conditions (i.e., sunny hillside, shaded lowland)—then record this information in a garden journal or notebook when you get home so you and those who inherit your garden will know about its genetic heritage. Removing a whole flowerhead with a shears is quick and prevents tugging damage … to the plant and your hands. If the seeds are well attached, cut long stems and hang whole stalks to dry upside down within a paper bag where seeds will get captured if they begin to fall. When collecting seed that can be shaken from its pod (such as that of Shooting Star), lay a dropcloth near the plant or use a plastic bucket to catch the spill, then funnel the seed into its marked bag. Seeds surrounded by fruity pulp (such as Jack-in-the-Pulpit) should be cleaned by soaking to remove the germination-inhibiting flesh. Usually the pulp will float, and mature seeds will sink. Dry the seed before storing. Pods (such as milkweeds) reveal their preparedness under the pressure of a squeeze. If the seam splits easily and the seeds are brown, they’re ready. You can recognize when some species (such as New England Aster) are ripe as their flowerheads become fluffy as dandelions do. When you get home and open your bag with your downy harvest, be sure there is no breeze blowing or you’ll be chasing the fluff around the room. You can tell when grass seed is ready to be picked by banging the seedhead against your hand. If most seed falls off easily, it’s ripe. Stroke up the stem to strip the little florets into your hand. Avoid collecting fruits or seeds from the ground unless they’ve fallen very recently. Once exposed to moist soil, they may harbor mold or insects which could contaminate your collection. If you can, check your collection sites periodically to target prime picking time. Some species’ seeds (such as Spiderwort) mature at staggered intervals, and pods (such as Baptisia) left in the field too long often become meals for insect pests. Maintaining records of your collection dates will give you a guide to schedule future pickings. For your convenience and high germination success, sow your seeds directly into your prepared landscape or flats you will keep outside all winter (protecting the flats from wildlife predation with screening or in a coldframe). You may still want to dry the seeds for a while as you amass the many flowers and grasses you want in your mix—a dozen species is okay, but see if you can’t get closer to 50 for a more natural effect and diversity of blooms. Late October through December is a good sowing time. Planting too early can cause fall germination, which many seedlings will not survive. You can even cast your seed in winter if you know snow will bury it quickly—otherwise it’s just bird food! However, good seed-to-soil contact is easier to control when the ground isn’t frozen—and that soil contact is highly influential in germination rates. When you return home, spread out your seeds on a newspaper in a well-ventilated room for a few days. If you can lay the newspaper on window screens, you will have effective drying racks. Do not place the seed directly on the screens as it can be difficult to retrieve. Hand threshing (rubbing pods against a screen with a gloved hand) will free the seeds from clinging stems and leaves which could harbor insects and mold spores that undermine seed viability. To save your seed for future planting, hang your harvest in paper bags in a cool, dry location, such as an unheated garage, out of direct sunlight, patrolling occasionally for rodent activity. You can leave the materials hanging, or, if you’re sure your seeds are thoroughly dried, you can store them in airtight containers in an area where temperatures will not fluctuate. Some seeds will germinate without any further treatment beyond drying. Many of our species will benefit from cold, moist stratification in your refrigerator. To imitate winter exposure, mix your seeds with sand that has had just enough water added to it so the sand holds its shape after being clenched in your fist, but no wetter than that. (Vermiculite or other sterile media are sometimes used in place of sand, but sand provides abrasion, lightly scratching [scarifying] seed surfaces, and that allows moisture to be absorbed more easily, hastening germination.) Place the mixture in a labeled and dated zip-lock bag toward the bottom of your refrigerator (33°F-40°F) for six to twelve weeks prior to a spring sowing. Regularly inspect the bag for sprouts or mold. If you spy either, sow ASAP. Additional techniques and materials—warm/moist stratification; boiling water; double-dormancy treatment; inoculation; seed-starting media; fertilizers—will improve the germination and growth of a few of the hard-to-grow species. Refer to species-specific advice in plant propagation guides such as Bill Cullina’s Growing and Propagating Wildflowers and Native Trees, Shrubs & Vines for such particular information—or simply trust that nature will usually handle most germination details for you over time. Keep in mind that wild seeds, unlike cultivated crops, germinate irregularly, sometimes over several years, and perennial species may spend a few years putting down roots before flowering. Do not judge your success solely by what you see happening in the first two years after sowing seed. Seed should be sown within a year of collection. Although some species (such as lupines) remain viable for many years, germination rates decline with age. Peeling back a rug that’s been lying over the Earth for at least several months (the longer the better), one is rewarded with loose, plant-free soil. Viable weed seeds may still be lurking in the top couple inches of soil, however, so scuff the surface only very lightly with a rake. Mix your seed with a dispersing medium such as a bucketful of sand or sawdust. This will help you cast seed more evenly across your planting bed. Once it has been thrown, rake very lightly again and, if practical, stomp across or roll over the entire surface — good seed-to-soil contact increases germination rates. You may choose to introduce potted plants at this time, too. The plants will require watering until they become established. The seeded areas will not require watering. Any number of variables about your site will influence what will happen next and how quickly it happens. To gain a realistic perspective, you should be in contact with people who are experienced with growing native plants in your locale.